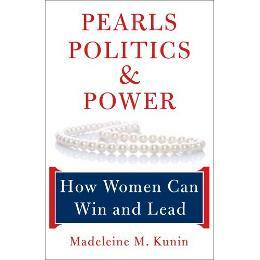 "Pearls, Politics and Power" is by Madeleine Kunin, former Governor of Vermont and Ambassador of Switzerland. I commend Kunin's research for this book. It's a collection of interviews and advice from women leaders across the nation, regarding their journey in politics. There are tons of tidbits for both girls and women that may be considering a political career. I advise any woman who is running for public office to read this. It answers questions like, what are the characteristics and traits of a woman holding office, how does she maintain that office, or how would she garner funds for her campaign and so on. You will be surprised by the answers. We all have this idea of what politicians are like. Sometimes it often hinder women from considering political careers. Women politicians enjoy the power, the sisterhood across party-lines, as well as the change they are making. Many are having fun and enjoying what they do. Even Kunin's personal story makes you feel joyous and proud of her work. This book is so important to American women. It discusses the advancement of women in nations that we least expect such as Latin America, Mexico and Canada which has a higher percentage of women in their legislative bodies than the United States. Women in the Rwanda parliament has the highest percentage than any place in the world, standing at 49%. Swiss women did not gain their right to vote until 1991, but the percentage of women in their parliament is greater than the U.S. Various nations have placed women as their prime ministers and heads of state, while the United States, a leading Democratic nation, lags severely behind, even though the women's movement came long before many others. The United States ranks 69th out of 187 countries. Kunin urges more women to consider political careers. Kunin claims that the perception of how a woman should be while holding policy is often misconstrued by women. It's safe to say that voters have this idea of an ideal candidate. They tend to vote for familiar qualities. This is a hindrance to potential women political leaders because these qualities are in opposition of many women. Few women hold political office simply because there are very few examples of women leadership in politics. Although women are the majority within the electorate, they represent 27% of individual contributions to candidates, party committees and PACs. Though women give 30% to women candidates while men only give 17% in contributions. Women have an interest in women becoming leaders, yet lag behind in funding political campaigns. This book may be a must-have for future women candidates, but it is a must-read for all women voters. Plus are resources for political training and mentor-ship for potential candidates. I think you will immensely enjoy what Madeleine Kunin and all her colleagues have to say. Check it out but think critically! Find out why it was named, "Pearls Politics and Power" by reading it for yourself. Kunin's book gets five out of five stars.